It’s been such a long winter I feel weird even saying this, but warm water fly fishing is back. Across the country the season’s first bass and muskie are coming to hand—and not a moment too soon. But successful early spring fishing for warm water species, smallmouth bass in particular, requires deliberate planning and execution. This week I sat down with Michigan smallmouth guru Mike Schultz to learn how to start putting fat bronzebacks in the boat before the trees even start to leaf. Here are Mike’s Top 5 moves for getting your bronze on in the early season, in his own words. #1. Fish the right water. It’s a fact that at this time of year 95 percent of the fish are in 5 percent of the water. This is not summer water. We call that ideal water we’re looking for “couch water”—it’s that slower water between 3 and 5 feet deep where smallmouth can get relief from the higher flows typical of spring. If it’s got wood or rock, even better. Spring fishing means targeting this type of water, which means strategic boat control. On our spring trips we routinely cover 10-12 miles of water. Are we casting every inch of that? No. Heck no. We’re jetting between spots and then slowing down and fishing the primest of the prime water slowly and methodically. It helps to fish water you know very well in the spring—or fish with guys who know it well. #2. Choose the right line. My line is my second most important piece of gear behind my boat. That’s right—not the fly, not the rod, but the line. There’s really nothing like Rio’s Outbound Short Floating/Intermediate in a 7- or 8-weight to match your rod (slower rods need to underline with this one). It’s got a sinking head with a floating mid-section and it allows us maximum verstaility in the constantly changing water of spring. It’s the line that allows us to fish our hottest fly, the Swingin’ D, most effectively—the foam head of that fly means you can cast behind a submerged log, fish the far end, then pause, let the fly come up to the surface and slip over the structure and continue the retrieve. We use a pretty short and simple leader for this technique: 18 inches of 25 lb fluorocarbon, 18 inches of 20 lb fluorocarbon, and 24 inches of 16 lb fluorocarbon. #3. Fishing in front of the boat. This is key for a number of reasons. The first is hooksets. This time of year a fish is going to eat and head for deeper water—which is to say it’s going to come right at the boat. And if you’re fishing straight out or behind the boat, that means a ton of slack, and slack is evil. Fishing in front of the boat improves your angle on the hookset—a fish is not coming at you, it’s more coming across you. Fishing in front of the boat also means it’s easier to impart a swooning action to your fly. It’s that prolonged pause where the natural materials and current come together to create a wounded baitfish action that spring smallies can’t resist. #4. Match colors and flash to water conditions. With blown-out chocolate milk water, darker dredging flies with copper or gold flash can be very effective. But I like to fish white baitfish patterns with pearl or mirage flash whenever possible because it’s easier for me to track and see the fly, and that increased visibility means I can see a subtle spring take that might otherwise be difficult to feel. People miss a lot of fish during the spring, and fishing a visible fly when the conditions allow is one way to combat that. #5. Fish with confidence. You hear that phrase a thousand times, but it’s especially important to keep in mind with early season smallmouth bass. A lot of folks are staying off the water thinking that it’s either too cold or too muddy or both. Most likely it’s neither. 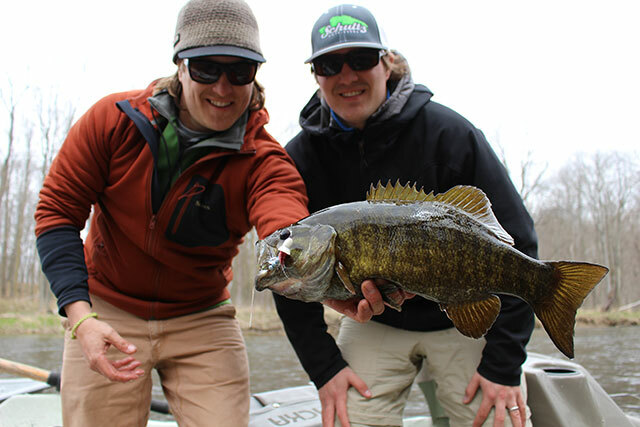 By the time smallmouth seasons open up across their respective ranges they are already a month out of their winter cycles. The fish we started catching on Southern Michigan’s late April opener were so fat they were about to bust. They didn’t get that way over night—they’d been eating for a while. Remember’s it’s anglers that are on that DNR calendar, not the fish. 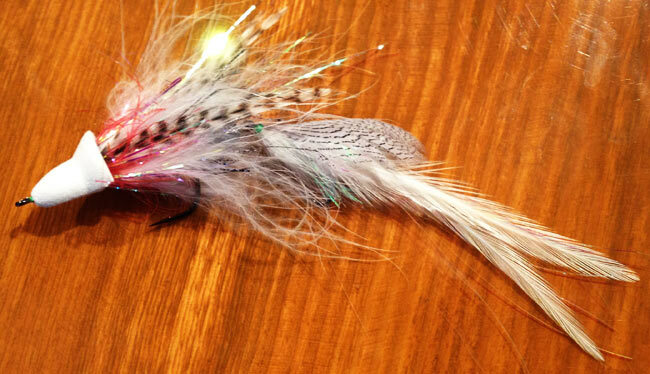 Below you’ll find the recipe for Mike’s hottest fly of the season, the Swingin’ D, a smallmouth-ified meditation on Tom Lynch’s Drunk & Disorderly series of trout streamers. This next-generation baitfish swims four ways at once, with more swooning than a Justin Beiber concert. If you’ve got a question or need materials, get in touch with Mike’s shop.